It’s not enough to “get it in writing” with regard to enforceability of a commercial lease of real property in Ohio, although that is a necessary first step. Ohio’s “Statute of Frauds” (ORC Section 1335.04) with respect to leases, provides in pertinent part that “no lease… of, in, or out of lands, tenements or hereditaments… shall be granted, except…in writing, signed by the party …granting it”. Ohio’s Landlord and Tenant Act (ORC Section 5321, et seq) supersedes the foregoing Statute of Frauds rule with regard to residential leases. With commercial leases of real property, however, there is no such exception. The second necessary step with regard to enforceability of commercial leases of real property in Ohio is acknowledgement (e.g., notarization). Often called the “Conveyancing Statute”, ORC Section 5301.01 provides in pertinent part that “leases [and deeds, mortgages, land contracts and other recordable instruments pertaining to real property] must be signed by the … lessor in the case of a … lease… [and] the signing shall be acknowledged by the… lessor… by a judge or clerk of a court of record in the state, or county auditor, county engineer, notary public, or mayor who shall certify the acknowledgement and subscribe the official’s name to the certificate of the acknowledgement.” While “size [of the lease] does not matter”, its duration does. ORC Section 5301.08, read together with ORC Section 5301.01 provides that a lease whose term is three (3) years or less does is not required to be acknowledged or recorded. 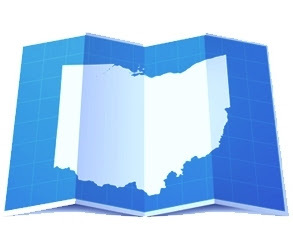 Stated another way, the law in Ohio provides that leases of non-residential real property whose terms exceed three (3) years must be in writing, signed and notarized (or otherwise acknowledged as provided in ORC Section 5301.01). How have Ohio courts interpreted these statutes? It is first important to note how they have not interpreted same. Ohio courts, as a general rule have not interpreted an improperly executed/acknowledged lease in the same manner as an improperly executed/acknowledged deed. With regards to improperly executed/acknowledged deeds, the Ohio Supreme Court in Citizens National Bank v. Denison (and Ohio appellate courts thereafter) has held that a deed is still valid despite a defective acknowledgment, but only as between the grantor and grantee. Regarding leases, however the law is settled in Ohio such that when a tenant takes possession under a defectively executed lease (and pays rent…), only a periodic tenancy will be implied to exist, in spite of the lease’s stated duration. So, if a ten (10) year commercial real estate lease is not notarized, and payments are made monthly, the general rule in Ohio is that only a month-to-month tenancy exists. As with most case law, there are exceptions to the aforesaid “general rule”. Two principal exceptions exist. The first is the equitable doctrine of “part performance” (which is not particular solely to leases). This doctrine basically dictates (based upon fairness/equity) that a lease (or other contract) should not be rendered unenforceable due to technical failures when much of the contract has been performed, at least in part, and other equitable factors are present. The often cited case with regards to a part performance “test” for a defectively executed/acknowledged lease is Delfino v. Paul Davies Chevrolet, Inc., 2 Ohio State 2d 282 (1965). According to the Ohio Supreme Court in Delfino, part performance can excuse failure to comply with the ORC Section 5301.01 when four factors are present: “1) unequivocal acts by the party relying on the agreement exist; 2) These acts are exclusively referable to the agreement; 3) the acts change the party’s position to its detriment; and 4) the acts make it impossible to place the parties in status quo.” While the court in Delfino established the test, it did not apply the doctrine of part performance in favor of its plaintiff-tenant. Delfino (the tenant) paid its landlord rent, however, there was no evidence that the plaintiff otherwise changed its position to his detriment, in reliance on the lease. In contrast, the Third District Court of Appeals in Sigg v. Subway Sandwich Shops (1997 Ohio App. Lexis 3381) found in favor of the tenant (Subway), applying the factors outlined in Delfino with regard to a deficiently executed lease. The court in Sigg held that Subway passed the “Delfino test” because Subway made substantial improvements to the premises with the understanding that it could remain at that location for 20 years pursuant to the lease. This constituted detrimental reliance, according to the court, effectively rendering the tenant unable to return to the “status quo”. The other relatively recent exception to ORC Section 5301.01concerns oil and gas leases. On April 15, 2013, the Federal District Court for the Northern District of Ohio in Cole v. E.V. Properties L.P. dismissed an Ohio landowner’s claims that oil and gas leases not properly notarized pursuant to Ohio law are invalid. The plaintiffs in this case admitted to signing oil and gas leases, but claimed that the leases should be declared invalid because there they were not notarized or otherwise acknowledged as required by Ohio Revised Code Sections 5301.01 and 5301.08. The court agreed with the defendants, however, reasoning that oil and gas leases are inherently different from traditional leases of real property. Apparently, the court felt that an oil and gas lease is more akin to the transfer of a deed interest, in which case the improperly executed/acknowledged lease would still be enforceable between the parties. The morale of this story? Get it in writing, sign it and get it notarized. Even if not required, it is always wise, to notarize. Notarization is such an easy, next to no cost procedure, and it will always be preferable to spending a lot of attorneys’ fees trying to carve out a new exception to ORC Section 5301.01.